LONDON - Liam Gallagher seems reluctant to do it, so the door is open for plenty of speculation. Liam was one of two focal points in Oasis, the other being Noel Gallagher. Noel, more or less, dominated Oasis with the short-fused Liam put in Noel’s shadow. Noel wrote most of the songs, talked a bigger talk than Oasis could walk and thus became the band’s voice. As most people who followed Oasis know, Liam and Noel fought constantly, leading Noel to leave the band and Liam to carry on as best he could. An underdog. 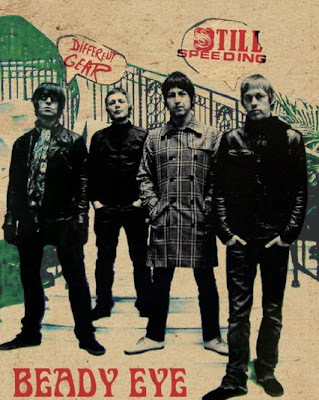 Which is why Beady Eye is such a revelation, even if Liam is matter-of-fact about the band and its album, Different Gear, Still Speeding. While Noel was pontificating, Liam was settling down and improving as a songwriter. He also could rely on the other guys in Oasis, which he’d inherited. They — Gem Archer, Andy Bell, Chris Sharrock — had songs and ideas of their own. “We wanted to show that we knew what we were doing,” notes Gallagher. Although he is miles away, talking on the telephone, it’s possible to imagine him saying this with a shrug. Oasis had been together 15 years. The transition to Beady Eye was, from that perspective, natural. However, this wasn’t Oasis, the point being made by taking a new name. Beady Eye signified a fresh start. Which is probably why the album sounds like a veteran band with the leash off. Without Noel calling the shots and being the dictator, the members of Beady Eye seem freed to try out a range of ideas. The resulting album has a freshness with colour and variety that the last few Oasis albums didn’t deliver. Still acting as a guideline, though, was Liam’s devotion to British invasion rock, especially to The Beatles. Beady Eye has elements of The Kinks and Small Faces in songs such as “Millionaire,” “Standing on the Edge of the Noise” or, tellingly, “Beatles and Stones” and “Wigwam” could be the band’s “It’s All Too Much,” Beatle George Harrison’s psychedelic opus. Gallagher figures the next Beady Eye album even has more of the Harrison flavour — of his All Things Must Pass album. But that second album is nowhere near completion. For now, the band is performing songs from the first album and developing.